All of the photos on this page are courtesy Michael Summa and were taken in 1969. Now the end of NY 124, this is Spring St. WB in South Salem. 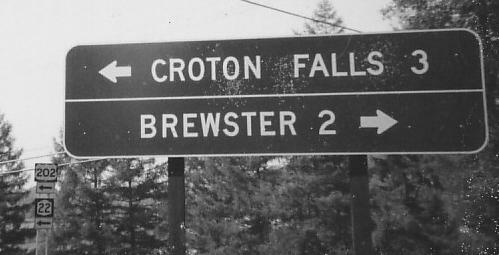 In 1969, 124 NB and 35 WB multiplexed west to NY 121. 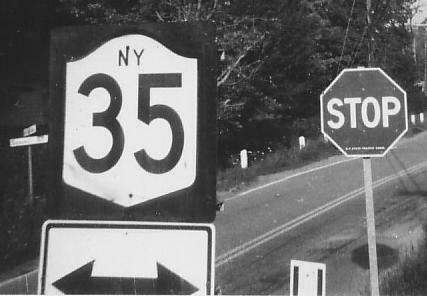 Even in 1969, these signs were old - the standard had already passed the first photo, and now dropped the "NY." The 121 shield is embossed, while the 124 shield is a next-generation replica of the original. This is now only NY 121, NB leaving NY 35. NY 138 EB at its end, where this time both shields are the original embossed variety - and by original, I mean 1920's. The 124 shield either originally had or still had cats'-eye reflectors, matching the JUNCTION on top. 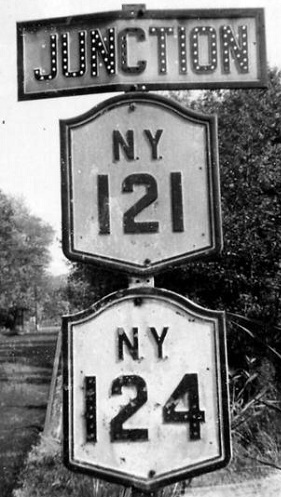 The original end of NY 124, when it was still 124. It's now Deans Corner Rd., Putnam CR 55 WB. Oddly, the 2's in the US 202 shield seem like the modern style, but those in the 22 shield are still the old New York font. This may be within a year or two of when that standards switchover occurred.